Today we can share the release date for the critically acclaimed The Walking Dead: The Telltale Series – A New Frontier on a special season pass disc at retail, and announce the release window for the upcoming Episode 3: ‘Above the Law’. Beginning February 28th at North American retailers, and March 3rd at European retailers, The Walking Dead: The Telltale Series – A New Frontier will be available for purchase on a special Season Pass Disc for PlayStation 4 and Xbox One consoles. The season pass disc includes the critically acclaimed two-part premiere episodes, and grants access to all subsequent episodes in the five episode season for download as they become available. In further news, today we can also confirm that the much-anticipated Episode 3: ‘Above the Law’ is set to debut later next month. Look for more details on the episode in the coming weeks. 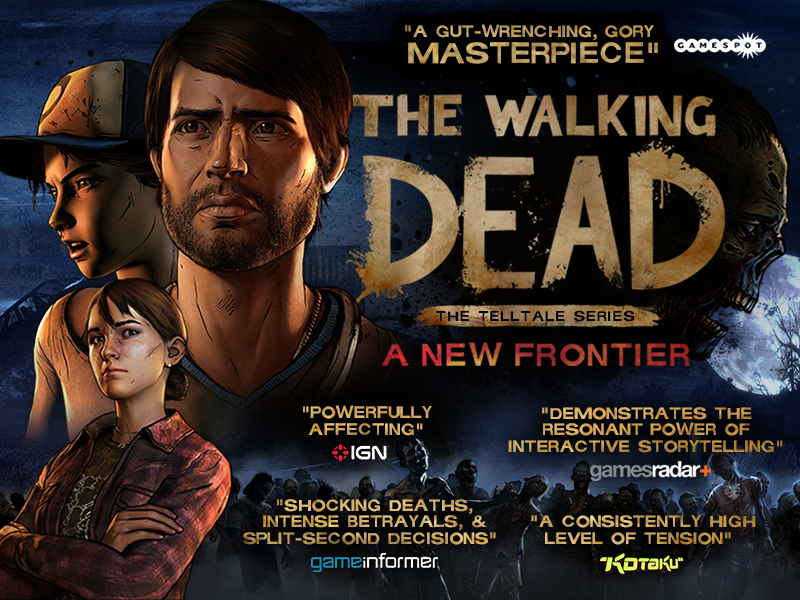 The Walking Dead: The Telltale Series – A New Frontier Episode One: ‘Ties That Bind’ Part I is rated ‘M’ (Mature) for Blood and Gore, Intense Violence, Strong Language, and Use of Drugs by the ESRB. Episode Two: ‘Ties That Bind’ Part II is rated ‘M’ (Mature) for Violence, Blood and Gore, Drug Reference, and Strong Language by the ESRB. Future content in the season is yet to be rated. For more information on the game, visit the official website, Facebook, and follow Telltale Games on Twitter. For more information on The Walking Dead, Robert Kirkman, and all of his titles, visit www.Skybound.com and www.TheWalkingDead.com .